This paper will trace Tuttle’s career from his early engagement with the artists of the Betty Parsons Gallery (including Agnes Martin and Ellsworth Kelly), to his scandalous retrospective at the Whitney Museum of American Art in 1975. I will argue that Tuttle’s pursuit of the zero degree can be understood as part of a career-long interrogation of the practice of drawing. In a reading of her chapter in a forthcoming book Anna Lovatt interprets the materiality of nothing with reference to Richard Tuttle’s critical investigation of drawing, drawing degree zero. All the ideas in this chapter are new to me, and the chapter has not yet been published, so it has not been easy to follow this through. What follows is a personal limited understanding with a focus on the ideas which resonated with my own thinking and work. Drawing degree zero relates to Roland Barthes ‘Writing Degree Zero’, in which Barthes was interested in creating colourless writing in the indicative mood middle zone (degree zero) distinguished from and between language and style. In a similar way Tuttle conceived line (the drawn line) as being in an in between zone of absence and emptiness that has little to do with signature or autobiography. In the ‘60s when Tuttle was exploring these ideas drawing was being dismissed by artists such as Pollock and Rothko and an exhibition of his minimalist work at the Whitney Museum of American Art in 1975 drew heavy criticism from the art critic Hilton Kramer, who wrote that if less is often considered to be more then ‘in Mr Tuttle’s work, less is unmistakably less… One is tempted to say, where art is concerned, less has never been as less than this’. Anna Lovatt pointed out, with some irony, that in the case of Tuttle’s exceedingly minimal work, less had clearly become excessive! Like Barthes, Tuttle explored how to stay in the neutral middle zone between the visible and invisible. He did this through working with white paper octagonals which he pasted to a wall of the same colour. Depending on your view you might or might not see these octagonals.  I was doing white paper octagons on a wall at a museum in Dallas. And the critic came along and made mock introductions, “Oh, this is Richard Tuttle. He’s interested in impermanence in the arts.” And she said that to Betty Parsons, and Betty just immediately snapped back, “What’s more permanent than the invisible?” It fits in with the whole line—that in any art form, there has to be an accounting of its opposite condition. If you’re going to be a visual artist, then there has to be something in the work that accounts for the possibility of the invisible, the opposite of the visual experience. That’s why it’s not like a table or a car or something. I think that that might even be hard for people because most of our visual experiences are of tables: it has no business being anything else but a table. But a painting or a sculpture really exists somewhere between itself, what it is, and what it is not—you know, the very thing. And how the artist engineers or manages that is the question. In 1971 Tuttle began work on wire octagonals. Anna Lovatt showed us his 10th Wire Octagonal, explaining that this work traces the outline of an absent object through three lines, the wire, the line and the shadow and introduced the notion of ‘shimmer’, which I understood to be the idea that the line is constantly shifting and moving because it is predicated on the position of the viewer. Each is made in the same way from the same materials – graphite (pencil), nails, and florist’s wire. 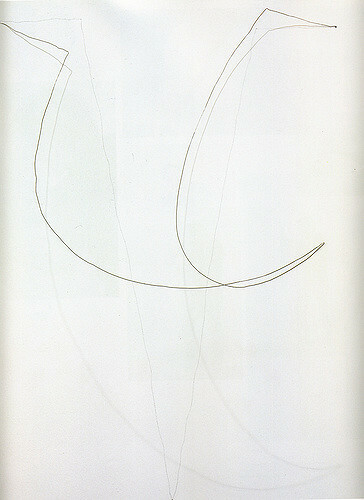 First Tuttle draws a looping line in pencil directly onto the wall. Next he places a length of thin flexible wire over the contour of the drawing, pinning it down so that it lies flat on the wall. While keeping each end of the wire attached by a nail, he then releases the wire so that it springs up and off the wall to create a new “line” above the original drawing. The released wire now casts a shadow, creating another line on the wall, which looks so much like the one in pencil that it is hard to determine which is which. By allowing the wire to take it’s own shape Tuttle relinquishes control and out of this steps the shadow over which he has no control. So this art is about a space between no personal expression and expression. My tentative understanding is that it is in this middle, empty, intangible space, a space of absence, between something and nothing that creativity, new ideas, alternative perspectives can emerge. Maybe teachers and learners need to do more to pursue and negotiate this space.